Years after becoming friends at Harvard, Ethan, Lisa, Sam, Nick, Max and Marianne are heading into a new era — their 40s. This series, directed and executive produced by Nicholas Stoller, delves into interwoven and complicated relationships, including former romantic entanglements and comedic explorations of old bonds. As everyone tries to manage their lives as adults, they also experience nostalgia. In the new eight part comedy series from Netflix we’re introduced to six adults in their 40s who reconnect after years apart from each other. The cast has incredible comedic talent with actors such as Keegan-Michael Key, Cobie Smulders, Nat Faxon, and Fred Savage to name a few. The series is directed by Nicholas Stoller who has had success in the cinemas with films Forgetting Sarah Marshall and Neighbours. Much like his pal Judd Apatow, usually his projects are more surreal with its characters, seeming as if the events being portrayed could happen. Friends from College is never able to take off, instead spending the duration of the series being about the characters reliving their glory days. Yes there is comedy but its too often one note with little substance. There is a scene where Key does all his best impressions, from Clinton to Obama, the problem is that it comes out of the blue and seems as if they wrote it in just so Key could flex his comedic muscles. It’s hard to take interest in the series when the majority of the characters are unlikable, often cheating on their loved ones with their friends from college. There’s nothing genuine about the characters, often they spew out how they wish it was the old days. All of the characters are in a funk, stuck holding onto the past, with none of them making any effort to move along. Keegan-Michael Key and Cobie Smulders are great as a married couple trying to build a family. As great as they are riffing off of one another, the tension between them can be felt as they both have different ambitions. It makes for a satisfying subplot and one that should have been expanded more. Nat Faxon who is always a delight in a supporting role is decent despite only having one real character trait, an older man who likes sleeping around with younger woman. Despite only being in a few episodes, Billy Eichner is great as Fred Savage’s boyfriend. His deadpan delivery is spot on while he also has scenes where he appears to be the realest character in the series. He’s well aware of the slump the main characters are in and consistently makes the point that this is unhealthy and kind of pathetic. Friends from College boasts a talented cast and a director/writer known for telling comedic stories about the average person. Here the story is rather vapid as the characters have no real depth to them and don’t make any progression throughout the series. From the beginning to the end of the series, nothing changes between the characters. 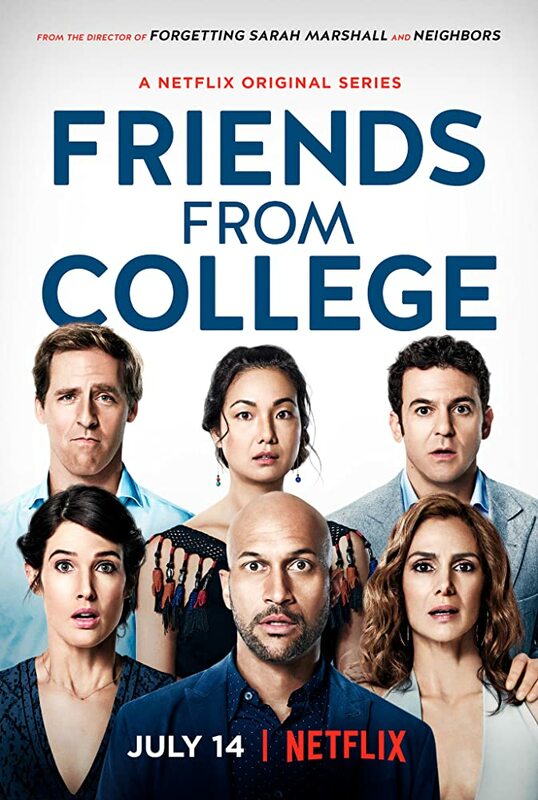 Nat Faxon is still a womanizer, Keegan-Michael Key is still cheating on Cobie Smulders with Annie Parisse, and Fred Savage is still an unreliable friend. If you’re a fan of the cast and you’re looking for an easy binge this might be for you, just don’t anticipate much of a story. Friends from College is now streaming on Netflix.